Hi, I'm Jason Akers, the host of The Self-Sufficient Gardener Podcast and contributor to Backwoods Home Magazine, Backhome Magazine and of course...Save Our Skills! When I'm not trying to get my garden to grow or writing, I like to fish, hunt and shoot. If you would like to learn more about maintaining a self sufficient garden visit my website and checkout my gardening podcast on iTunes. 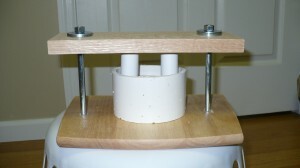 In my last post I took you through the process of making a cheese press. Today I take you through the process of filling said press with delicious cheddar cheese. I will apologize beforehand about my lack of video skills. Legend tells of a merchant traveling across the desert sometime after the first civilization took root. At his side was a skin full of liquid–a canteen more or less. The more appropriate word would have been stomach because…well it was basically a calf’s stomach–yum! And it was full to the brim with that trusty desert thirst quencher–MILK. Anyone queasy yet? I only mention all these details because they turned out to be kind of important. So our dusty traveler stops to take a drink only to find his milk went chunky. His first instinct was probably to stick his head in the first water hole around but since it was the desert I guess he just toughed it out. But it turned out that the chunks weren’t bad–not like when milk goes bad normally. The calf’s stomach was full of an enzyme called rennet which helps calves digest mother’s milk. The “breaking” of milk divides it into two things–one of them being the basis of cheese. That’s kind of where the legend jumps to more modern times. I wonder how long mankind had to eat chunky milk/cheese before the first deliciously smooth smoky cheddar goodness. Well thankfully we no longer have to worry about that…or do we? My first forays into cheesemaking went great until the time came to make curds into cheese. My missing tool was a cheese press. I searched online and found a sleek stainless steel model-the Rolls Royce of cheese presses–with a Rolls Royce price. There was no way I was going to pay hundreds of dollars for a cheese press. Lucky I found a few articles online and in print regarding building homemade cheese presses. Here’s my version of that design. 6. 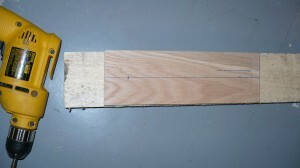 A wooden cutting board (about a foot long)–normally this will make the pusher board and the base surface. You should be able to pick up all of that for less than 10 bucks. You may find ways to substitute things so read the directions first and then modify (like I did). 1. 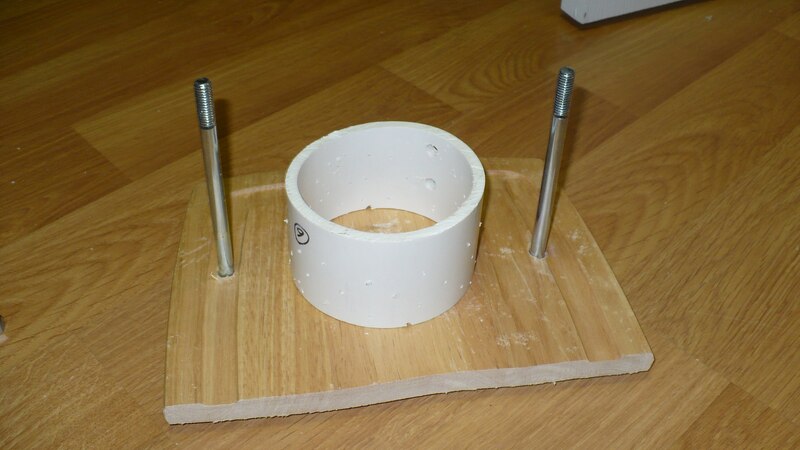 Draw the inside circle of your large PVC onto what will be the unused surface of the cutting board or other suitable chunk of wood and cut it out with a jigsaw or other appropriate power tool. 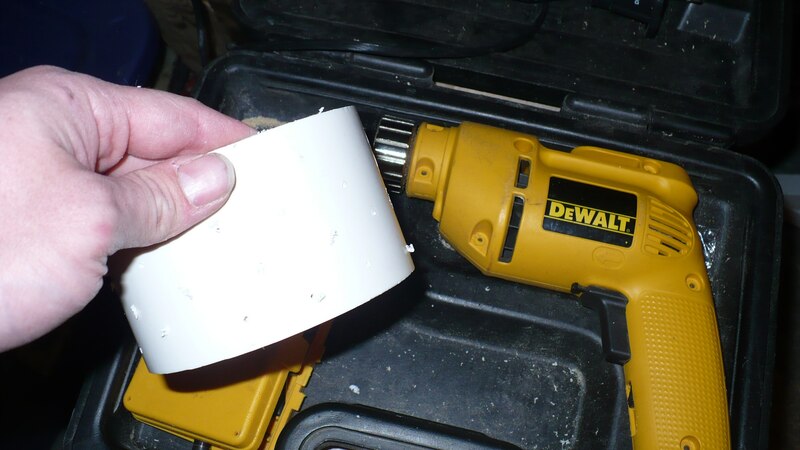 Cut your large and small PVC to length. Further ahead you will find out that I cut the smaller ones way too long and had to cut them down again. I am really bad about measuring things and usually I just cut to fit. 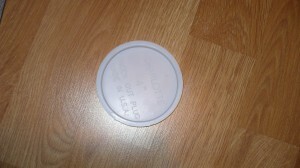 The PVC pieces must be completely flat on one side. That is the side that will be against the base or the follower. And the larger piece should be about 4-5″ tall. You can also cut your cutting board down to a more compact size. 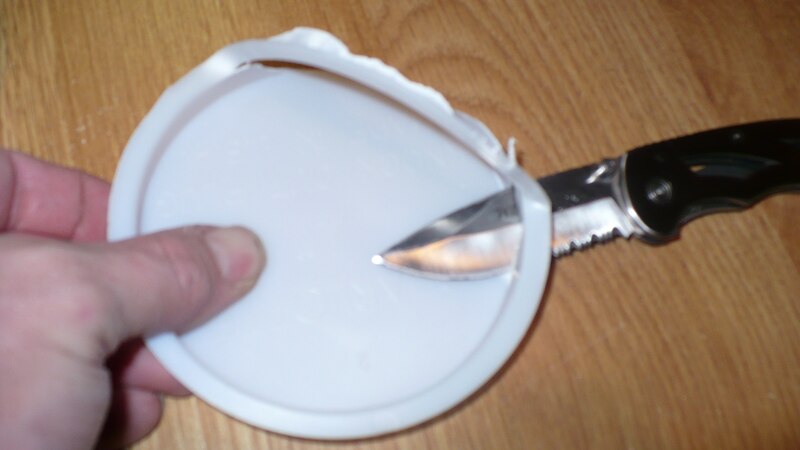 Since you probably have cut your round out of it, you may want to cut of the sharp corners. 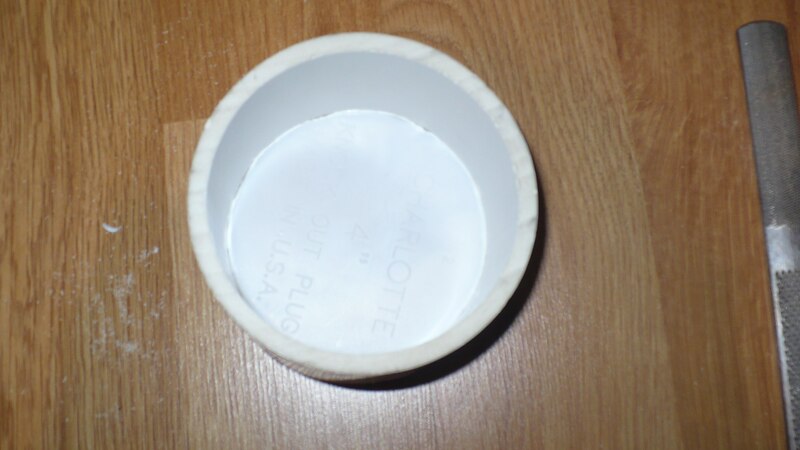 If there is enough left, cut out your pusher board or find a suitable replacement. 2. Note the rasp, next step is to clean up the edges. 3. Check the fit–doesn’t have to be exact. 4. 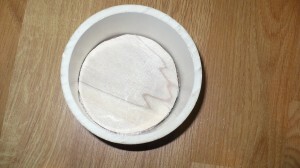 Take the knockout cap (because in plumbing jobs it’s temporary) and remove the flange. It wasn’t in the original picture because it was an afterthought. 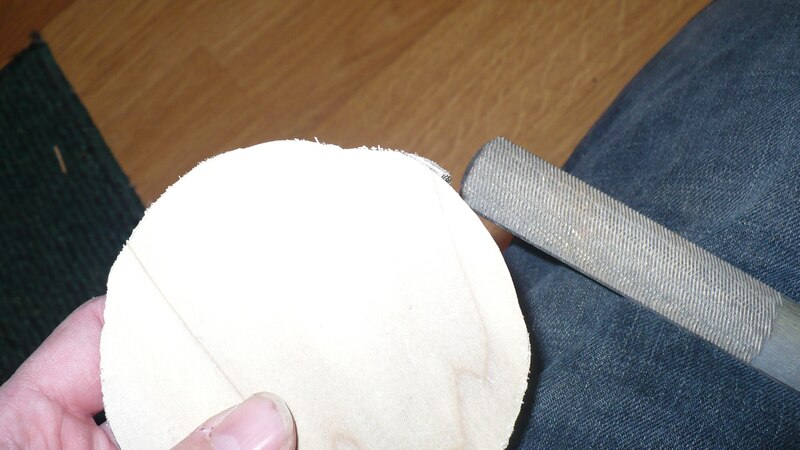 If your wood block fits perfect you don’t really need it, but its so hard to get the wood follower just right. Check the fit on the cap after you are done. 5. 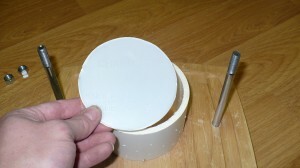 Drill 1/16″ holes about an inch apart up/down and around the circumference of the big PVC. I also like to file in weep notches on the bottom surface. Resist the urge to cleanup the holes on the inside with sandpaper. You want to protect the inside surface from scratches which harbor nasties. Use your thumbnail instead. 6. 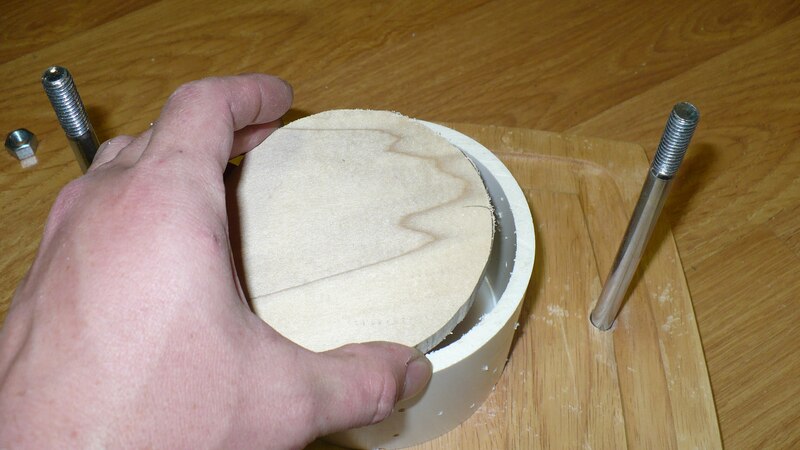 Drill holes with matching spacing through your pusher board and your base cutting board. 7. Begin assembly. From the bottom up. 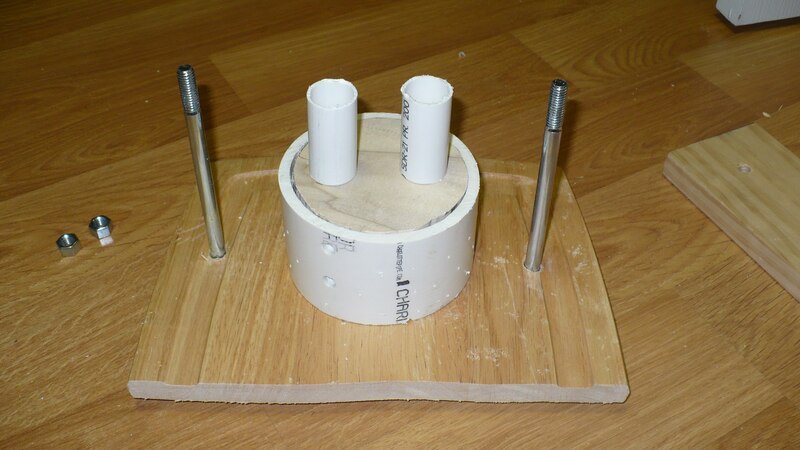 Two bolts–>two washers for each bolt—>into the cutting board base—>large PVC on top. 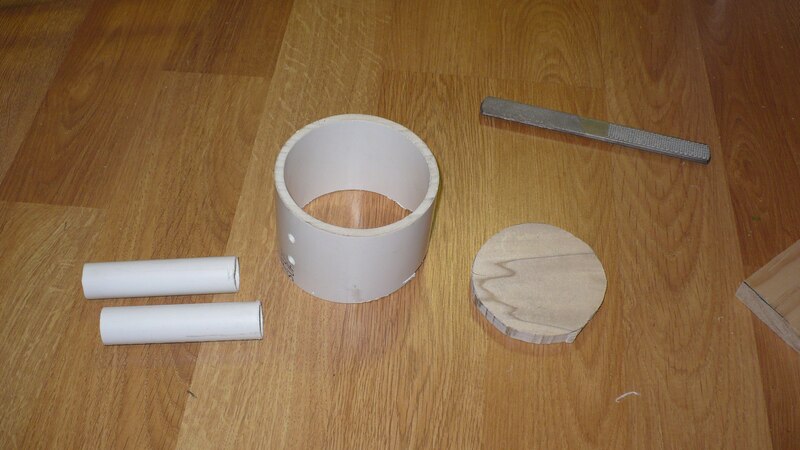 You may have to recut the small PVC pieces. You can see here that this is about the exact distance you want. The PVC pushers must be just shorter than bolts when the followers are in place and at TDC (top dead center). 8. Add pusher board, washers then nuts. Want more options? 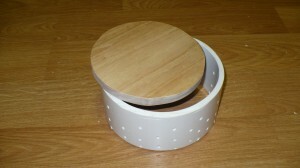 You can build mold and follower sets for various sizes. Here’s my mack daddy-sized set. After the build, put all of your stuff here that touches food into a dishwasher and blast the heck out of it. The great thing about this design is that it allows you to utilize one of two methods of pressing. You can either use mechanical force by tightening the nuts and bolts or you can place a weighted object on top. Some recipes call for a certain weight to be added so it helps to be able to adjust to the learning curve. Hopefully in a future post I can take you though the cheesemaking process. For several years now I’ve wanted to keep bees. However the price of equipment and the bees has been prohibitively high for my taste. Combine that with the fact that I always found myself with neighbors somewhat close and I have sufficient reason to not want the trouble. Now that I have a small piece of land with a little acreage and fruit trees, I not only am able but also actually need to keep some bees for pollination. I had to find some way to offset the costs a bit in order to get me into this interesting hobby. After a ton of research on the Internet and in books I’d borrowed from the local library I found a way to accomplish that goal. I discovered an alternative to the expensive commercial type artificial beehives. I found the top-bar hive. The top-bar hive is nothing new. In fact, this type of hive is actually thousands of years old, much older than the Langstroth commercial types in use today. In ancient times these hives were built from baskets with small holes and bars were laid across the top that allowed the bees to build their combs. These types of hives are exceedingly simple to build and maintain which makes it ideal for the use I intend, as I will not be on this piece of property full time. In fact, there is at least anecdotal evidence that top-bar hives are more resistant to colony collapse disorder. As a big plus, they are cheap to build. Makeshift ones can be built from plastic or metal barrels sawed in half and with some limited hardware and a lid. In fact, in all of my research I could only find one drawback to this type of hive. The top bars without frames do not allow for honey extraction without destruction of the comb. I don’t find this to be a huge problem as I may not even get to extract the honey the first year or so. The problem is that destroying or harvesting the comb requires the colony to spend time and energy rebuilding it to store more honey. Because I’m not a commercial beekeeper it really doesn’t bother me much. So as a winter project I decided that I would build my own top-bar hive (TBH for short) and I would do it in the most economic way possible. That meant scrounging materials, making use of what was available in creative ways and resisting the urge to run down to the hardware store to buy things. To build one like I built there is a simple material list that I will provide. Almost anything on the list is optional even the lumber. This can be built in so many different ways that I won’t even give detailed drawings besides just some crude line sketches. Looking at my pictures and researching on the web will show that no one builds two alike and even though I am happy with mine, I’d build the next one differently. I had some wood in my workshop but I knew where I could get tons of good solid oak boards for free. I work at an automotive factory and everyday we pack dumpsters full of nice pallets. Most of the wood is cheap but a few that hold steel coils are solid and that’s where I found my oak. The boards are roughly 48” long, 10” wide and about an inch and a half thick. Luckily they are tough enough to withstand being taken apart from the pallet. As skids beneath these boards there are heavy 4×4 inch oak beams. So for the bottom board and the sides I decided to use the oak planks. I decided that the 4×4 beams would be great for legs (something not all TBH have). I used some leftover plywood from a train table I built for my son for the ends and the roof. Basically you simply take the end boards and mark an angled line on each side. The angle should be the same on both sides but I guess if you were off really bad it wouldn’t really matter. Make the same line marks on both end pieces. You can actually make the size of the end pieces work for you here as you determine the angles. My end boards are about 2×2 feet in dimension. The angle I chose is about 25 degrees. If I had it to do over again I would have chose a much more acute angle. 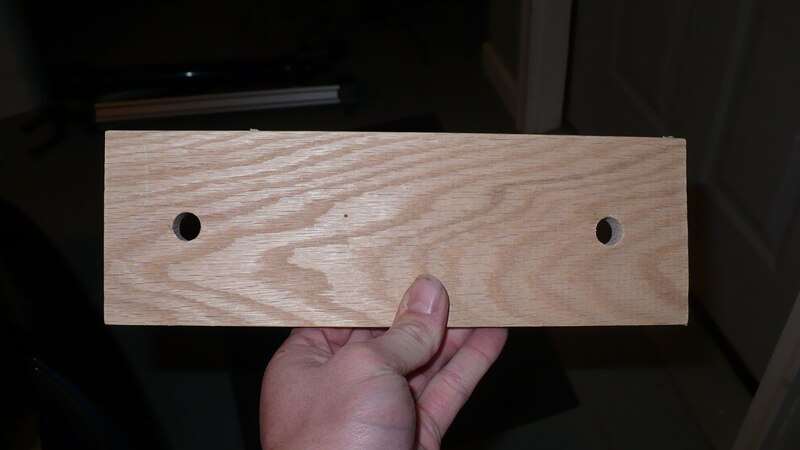 Once you have the lines marked, pre-drill and run your screws in to join the ends to the planks. Depending on the size of your ends and planks you may need to place two planks per side. 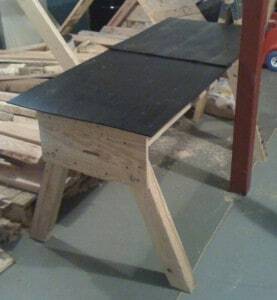 I joined my top and bottom planks on each side with a small piece of 2×4 scrap. This also gave me another surface to hold screws. 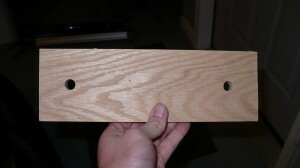 Once I had what I called the general frame built I added a bottom board on two hinges spaced equidistant from the ends. Then I added the metal screen over the bottom. The screen allows ventilation in warmer times and the varroa mites that infect the bee colony will fall through the screen instead of being able to climb back up. The bottom board is on hinges so it can hang free most of the year but can be reinstalled come colder weather. There are about a million ways to accomplish the same thing. This may not be the best. For the roof, I cut a piece of plywood big enough to overhang the top opening by some distance. 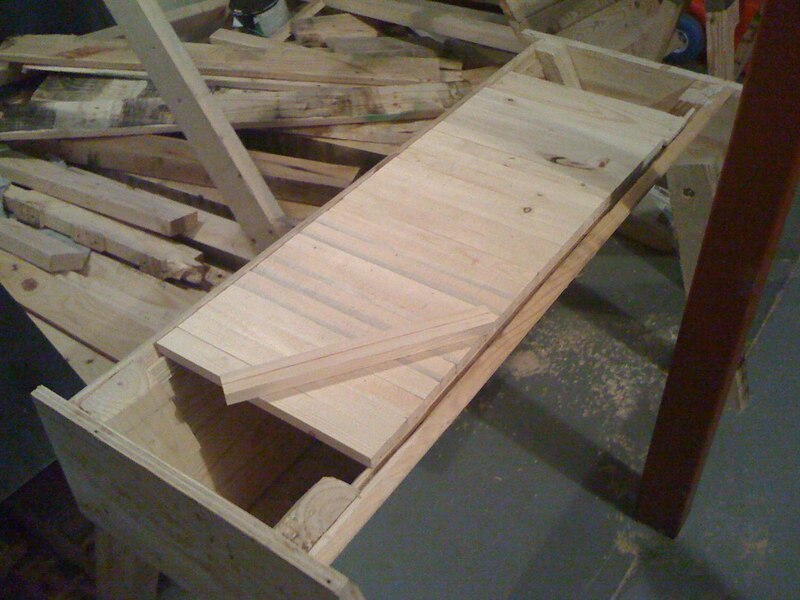 Then I placed runner boards that were just big enough to slip over the box itself. The fit is tight and snug. Bees will tend to glue things together if they are letting in too much cold or weather. They will also stand at entrances and fan if things get too hot. 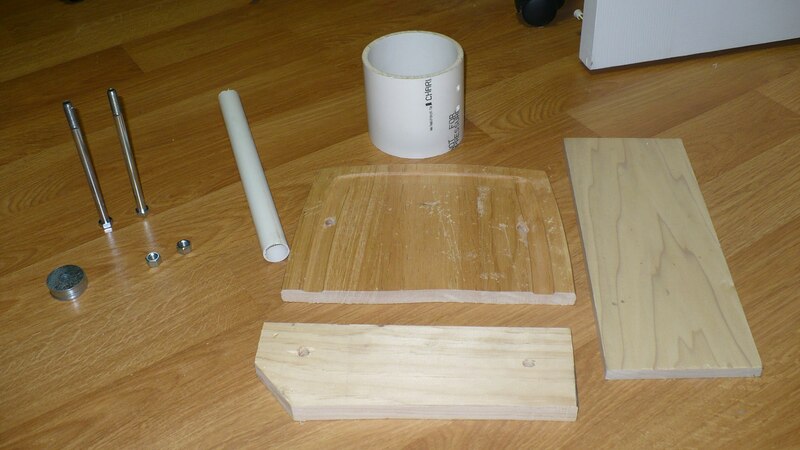 I then took and stapled and glued a few pieces of black corrugated plastic that was thrown away at work as well. It is completely weatherproof and lightweight. 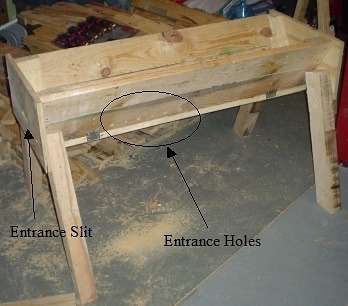 At this point you can drill your entrances, add the bars and you are done if you intend on hanging the hive from a tree or sitting it across stumps. For me, I really want it to have legs. It brings it to a height where working is easy and you don’t want to be working with bees and having to bend. You can get them caught in some bad places. I simply took a few of the beams and cut them to equal lengths and bolted them to the end pieces. They are in very snug and should I find them a problem, I can quickly remove them. Most people recommend you drill one set of entrance holes. I am a belt and suspenders type of guy so I did two. One is a simple slit at the front where the bees can slide in and out. ¼” is apparently the best size from my research so the slit is ¼” tall and about 4 inches long. The length isn’t greatly important. 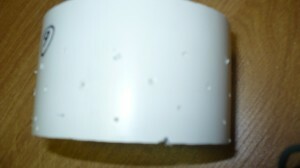 I then drilled in ¼” and ½” holes about every 4” along the side. This should give them some ventilation and extra spots to enter if one becomes crowded. If they have too many, they can always seal one up. The top bars were the easiest part. 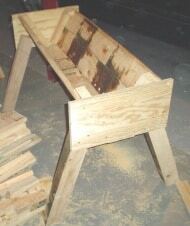 I simply removed the roof and installed a few runner boards near the top of the frame on the inner sides. This allows the bars a place to seat. I’d like to have secured them better. I had a little room at the back so I put a spacer board to fill the gap. 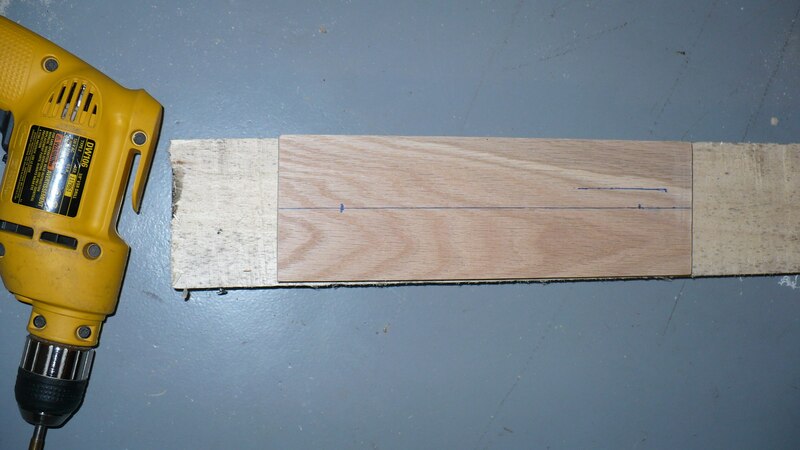 From my research I determined that 1 3/8” bars are the optimal size so after accepting a donation from relatives of some scrap 2” thick pine boards I slit them to 1 3/8” wide and just long enough to fit on the runners, which ended up being about 16”. I then set the table saw blade much shallower and made a 1/8 inch groove about half an inch deep down the length of each bar. The groove was precisely in the middle (3/4” inward from each side). This groove will aid the bees and give them a foothold when they build the downward hanging comb. Don’t cut them in and the bees will not only have a hard time but also so will the beekeeper. I then placed all the bars in and made sure they were reasonably snug and replaced the roof. Hopefully an update will follow this Spring when I place the bees!